An insidious cabal has decided to change the direction of the United Alliance of Stars (UAS) with a coup d’etat—but not through a military takeover. They have devised a subtler coup—the manipulation of the Unified Alliance of Stars Committee, the fifteen-star system that sets policy for the UAS. Calling itself WEP for We the People, they have issued an ultimatum: revise the UAS Constitution or they will kill those who oppose the change. And good to their word, shortly afterward Committee delegates are being killed. The UAS Committee enlists their de facto troubleshooter, Anna Paulus, to shut down the cabal, but insists she leave the NIA and manage UAS Committee Security. For Anna it’s a nightmare scenario, leaving her safe and comfortable world for a completely new environment dominated by macho men with years of combat experience. Adding to her concerns, she can imagine herself WEP’s prime target. Anna soon realizes that things are not what they seem, and the cabal is quick to recognize her involvement as a potential problem. To make matters worse, the cabal is only months from succeeding—only Anna and her red-headed krait stand in their way. 5.0 out of 5 starsCharacter stayed true! I enjoyed this book. It is the first book I've read by C R Daems, and I'm going to check out the first book in this series. This is an entertaining, formulaic romp. The main character is very interesting and I really enjoyed how she responded to situations and her investigative process. If I end up enjoying the series, I 'll append a note to this review. I have enjoyed all of C.R. Daems books. This series has been fun to read. All of his books have strong protagonists who work the the struggle of the life they living. There are no easy answers to the problems they have or are solving. Also there is a consistent theme of training studying, learning, attempting to learn, and being consistent keep up martial skills. All this blending to create an atmosphere of being professional which make one competent Then there is a love for doing the work well when doing your job. As in previous installments, it's a combination of a police procedural and a thriller -- in a future space-faring civilization not much different from our own. The world-building is not a strong point here, but the action is quick, and the main character is likable. I enjoyed this, and would like to see more books in this series. 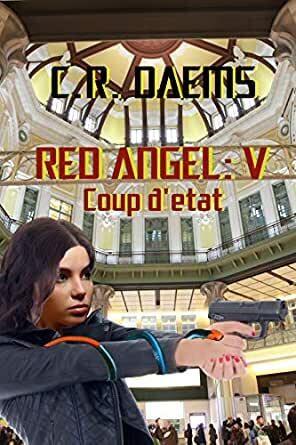 Yes - - I was up all night reading the latest Anna and Red Angel novel. A very enjoyable read. Anna seems more mature and transitions well to the Director of UAS Committee Security. She gets sooo much practice using her P1A badge. I'm looking forward to more Red Angel novels. She may be recalled as an active admiral. She may meet Mr Right while chasing more bad guys. I'm definitely hoping and looking forward to more stories. C.R. Daems feel free to contact me for any suggestions on directions - the boundaries are limitless of course. Keep up the fantastic job! I really have enjoyed the twist and turns in this series. We have seen the Anna growth from a troubled and quiet child to one of the best investigators for Navel Intelligence. This story continues to shows Anna's strength of will and determination, while showing her growth as a leader. While Anna continues to chase the evil of the universe, with her unorthodox methods and "At All Cost" attitude, she may have found a place where she belongs.